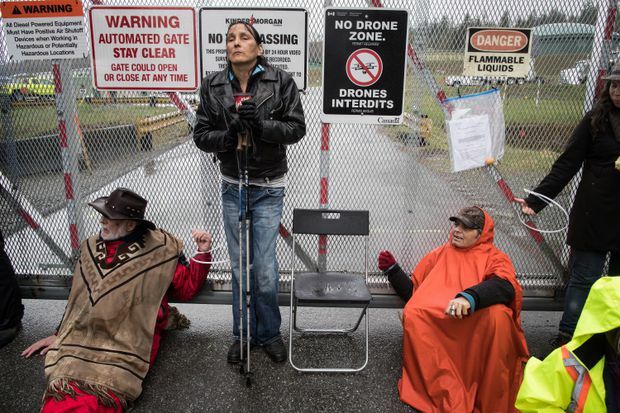 Protesters opposed to the Kinder Morgan Trans Mountain pipeline extension defy a court order and block an entrance to the company's property, in Burnaby, B.C., on Saturday. Kinder Morgan has suspended all “non-essential” spending on its Trans Mountain pipeline expansion due to opposition from the British Columbia government, issuing an ultimatum that it won’t commit any more dollars to the $7.4-billion project unless it can get agreement from the province to stand aside by the end of May. The fate of the project — which has become the focal point of a larger Canadian debate over environment protection versus energy development, and federal authority versus local interests — could be decided in the weeks ahead. The pipeline company said in a news release Sunday it will consult with stakeholders in an effort to reach agreements by May 31 that could allow the project to still go ahead. “If we cannot reach agreement by May 31st, it is difficult to conceive of any scenario in which we would proceed with the project,” Kinder Morgan chief executive officer Steve Kean said in a news release. The announcement from the American pipeline company is a blow to both Prime Minister Justin Trudeau and Alberta Premier Rachel Notley, who have been aligned in the message that environmental progress must be balanced with economic development, and the project is in the national economic interest. The demand from Kinder Morgan comes six months after TransCanada Corp. pulled the plug on its $15.7-billion Energy East pipeline citing “changed circumstances.” Mr. Trudeau said it was a business decision, and “market conditions have changed fundamentally since Energy East was first proposed.” However, critics said Ottawa’s climate-change policies created unfair burdens on Western crude producers while refineries in Quebec and New Brunswick import oil from Venezuela and Saudi Arabia – countries that haven’t imposed greenhouse gas regulations. Late Sunday, federal Natural Resources Minister Jim Carr called on British Columbia Premier John Horgan and his government to end all threats of delay to the Trans Mountain expansion. “His government’s actions stand to harm the entire Canadian economy. At a time of great global trade uncertainty, the importance of Canada’s role in the global energy market is bigger than individual projects and provinces,” Mr. Carr said in a news release. Mr. Horgan said that he remains resolute in his opposition to the Trans Mountain pipeline expansion, which he said is not in B.C’s interest, given the risks of moving more bitumen across the province, so should not proceed. In Victoria, Mr. Horgan said he believes in the province’s rights to look out for its own interests, and downplayed the prospect of consequences ranging from Alberta measures against B.C. or compromising the national climate-change plan through B.C.’s opposition. The warning from Kinder Morgan spurred a quick reaction from Ms. Notley, who told reporters Sunday her government will do whatever it takes to get the pipeline expansion built — including the government becoming a direct investor in the project. The Alberta Premier said the Houston-based board of Kinder Morgan is frustrated that it doesn’t know how many more legal battles it will have to fight — even if the project’s federal approval clearly puts it in the right. Those critics of Mr. Trudeau and Ms. Notley said given that history, Kinder Morgan’s decision to suspend spending on the expansion project is entirely predictable. Alberta United Conservative Party Leader Jason Kenney added that B.C.’s strategy as long been “death by delay,” and that is playing out before everyone’s eyes. “If we can’t get this pipeline built, it means Canada is broken,” Mr. Kenney said late Sunday. The proposed expansion of the existing Trans Mountain pipeline would allow Alberta to nearly triple shipments of oil and refined products to a terminal in Burnaby, bringing enough scale to the line for exports to overseas markets to become commercially viable. “Today, KML is a very good midstream energy company, with limited debt. The uncertainty as to whether we will be able to finish what we start leads us to the conclusion that we should protect the value that KML has, rather than risking billions of dollars on an outcome that is outside of our control,” Mr. Kean said on Sunday. Mr. Kean said the company has promised to be judicious in the use of shareholder funds. “A company cannot resolve differences between governments. While we have succeeded in all legal challenges to date, a company cannot litigate its way to an in-service pipeline amidst jurisdictional differences between governments,” Mr. Kean added. Grand Chief Stewart Phillip, president of the Union of B.C. Indian Chiefs, said in an interview on Sunday that he is “really encouraged” by news he sees as the beginning of the end for the expansion of the Trans Mountain pipeline.